Download "Express Scripts Medicare TM (PDP) through State of Delaware Medicare Retiree Prescription Plan Frequently Asked Questions"
1 Express Scripts Medicare TM (PDP) through State of Delaware Medicare Retiree Prescription Plan Frequently Asked Questions Section 1 General Information (Questions 1-5) Section 2 Enrollment Information (Questions 6-11) Section 3 Using the Express Scripts Medicare Plan (Questions 12-24) SECTION 1 - GENERAL INFORMATION 1. What is the prescription plan, through the State of Delaware, for Medicare-eligible retirees? This is an enhanced Medicare Part D plan administered by Express Scripts and called Express Scripts Medicare (PDP) for the State of Delaware (PDP stands for Prescription Drug Plan). 2. Is this different from standard Medicare Part D plans? Yes, the Express Scripts Medicare plan is an enhanced Medicare Part D plan which provides additional coverage for certain prescription drugs and eliminates the deductible and coverage gap which are normally part of a standard Medicare Part D plan. 3. Since this is a Medicare Part D plan, am I responsible for drug costs in the deductible and the coverage gap (donut hole) stages? No. The enhanced plan provides coverage during the deductible and coverage gap stages. You will continue to pay the same copays you now pay through the 2015 plan year. The enhanced Medicare Part-D plan will pay the remaining costs. 4. 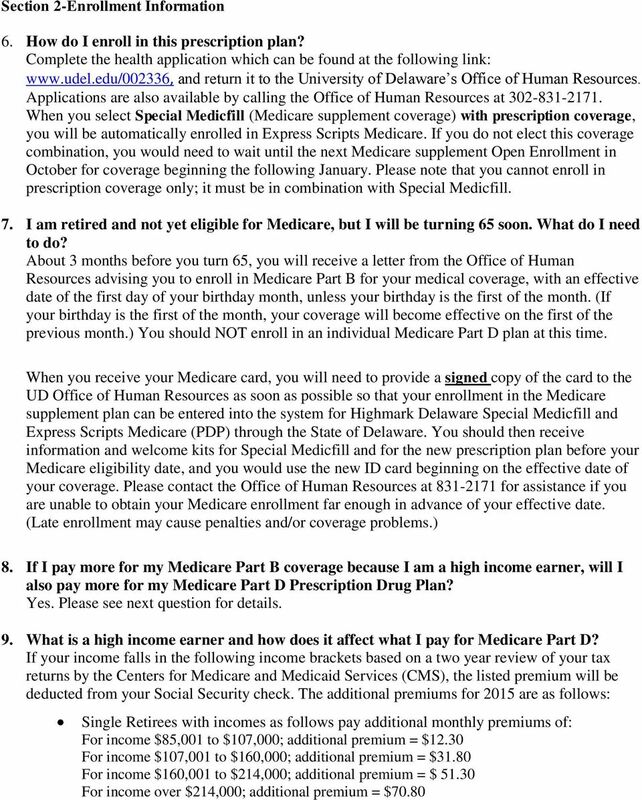 What is the additional coverage provided under the Express Scripts Medicare TM PDP through the State of Delaware? Some drugs that are not covered in a standard Medicare Part D Plan will be covered as part of the enhanced drug benefit plan. Plus, some prescription drugs in Medicare Part D s non-preferred category will be covered in a lower tier as preferred under the plan. These medications are listed separately in your Welcome Kit. 5. What pharmacies can I use? Are pharmacies outside of Delaware included? The retail pharmacy network remains the same as Veterans Administration (VA) pharmacies and Military Base Pharmacies (such as Dover Air Force Base are not included in the network see also Questions 18 and 19). There are network pharmacies in all 50 states, and you can contact Express Scripts at to ask about a particular pharmacy or location. 3 Married Retirees with incomes as follows pay additional monthly premiums of: For income $170,002 to $214,000; additional premium = $12.30 For income $214,001 to $320,000; additional premium = $31.80 For income $320,001 to $428,000; additional premium = $51.30 For income over $428,000; additional premium = $70.80 Married Retirees who file separate tax returns from their spouses and have incomes as follows pay additional monthly premiums of: For income $85,000 to $129,000; additional premium = $51.30 For income greater than $129,000; additional premium = $ If my income falls into one of the high income earner brackets listed above, how will I know and when can I expect the additional premiums to start being deducted from my Social Security check? You will receive a letter from the Social Security Administration to notify you of the additional premium to be deducted from your Social Security check, and when the additional deduction will begin. 11. My spouse s former employer has elected to outsource Medicare retiree benefits to Extend Health, or another vendor. The employer will no longer cover my spouse directly, but provides a set amount per year toward enrolling in coverage through Extend Health. Is my spouse required to enroll in this medical and prescription coverage, since it is no longer provided directly from the former employer? Unless the amount provided by your former employer covers less than 50% of the cost of the least expensive premium available for your spouse only, he or she must enroll in medical coverage. However, your spouse is not required to enroll in prescription coverage through the employer. 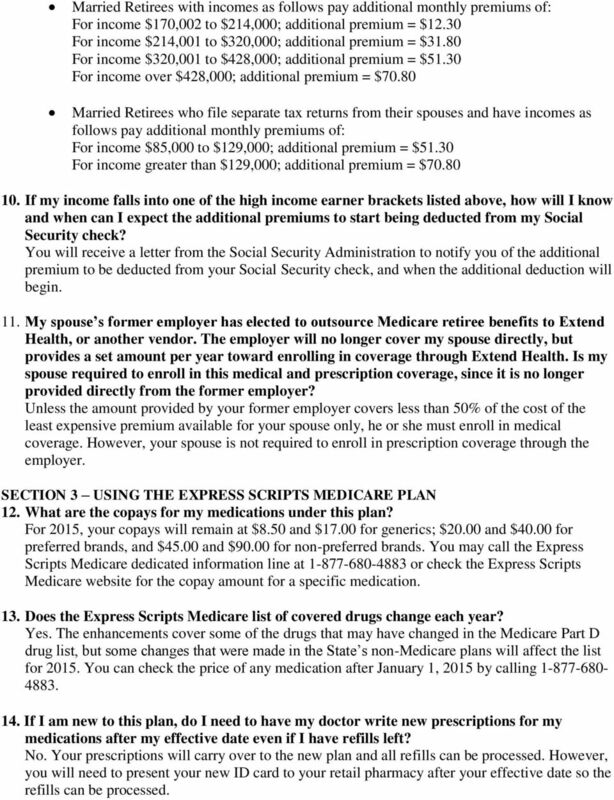 SECTION 3 USING THE EXPRESS SCRIPTS MEDICARE PLAN 12. What are the copays for my medications under this plan? For 2015, your copays will remain at $8.50 and $17.00 for generics; $20.00 and $40.00 for preferred brands, and $45.00 and $90.00 for non-preferred brands. You may call the Express Scripts Medicare dedicated information line at or check the Express Scripts Medicare website for the copay amount for a specific medication. 13. Does the Express Scripts Medicare list of covered drugs change each year? Yes. The enhancements cover some of the drugs that may have changed in the Medicare Part D drug list, but some changes that were made in the State s non-medicare plans will affect the list for You can check the price of any medication after January 1, 2015 by calling If I am new to this plan, do I need to have my doctor write new prescriptions for my medications after my effective date even if I have refills left? No. Your prescriptions will carry over to the new plan and all refills can be processed. However, you will need to present your new ID card to your retail pharmacy after your effective date so the refills can be processed. 4 15. I am enrolling in Express Scripts Medicare and am currently taking a specialty medication which I fill through the specialty pharmacy (either Accredo or Biotek). Will the specialty pharmacy get my new information? If you are new to the plan, the specialty pharmacy will have your new ID information effective January 1, 2015 and you are not required to obtain new prescriptions. The special services provided by Accredo and Biotek will also remain the same. However, after your new coverage begins, you will no longer be required by the plan to use mail order, and you may fill your specialty prescriptions at a retail pharmacy with no difference in your copay. 16. How do I know if a medication requires a Prior Authorization (PA)? You can contact the Express Scripts Medicare dedicated information line at After January 1, 2015, Express Scripts will be able to tell you if your medication requires a Prior Authorization. Express Scripts will also mail letters prior to January 1, 2015 to members who currently have a Prior Authorization explaining how to obtain a new PA. If you do not receive a notice or are not able to get the new PA before your first fill in 2015, you will be able to get a 31- day supply of medication at the pharmacy while the PA approval is being established. 17. I take a brand name drug because I cannot take the generic equivalent. Do I need to get a prior authorization to fill the brand? No, you may take the brand name drug if you cannot take the generic equivalent without a prior authorization under this plan. However, you will pay the non-preferred copay for the brand. 18. I am a military retiree. How does this plan work with Tricare? 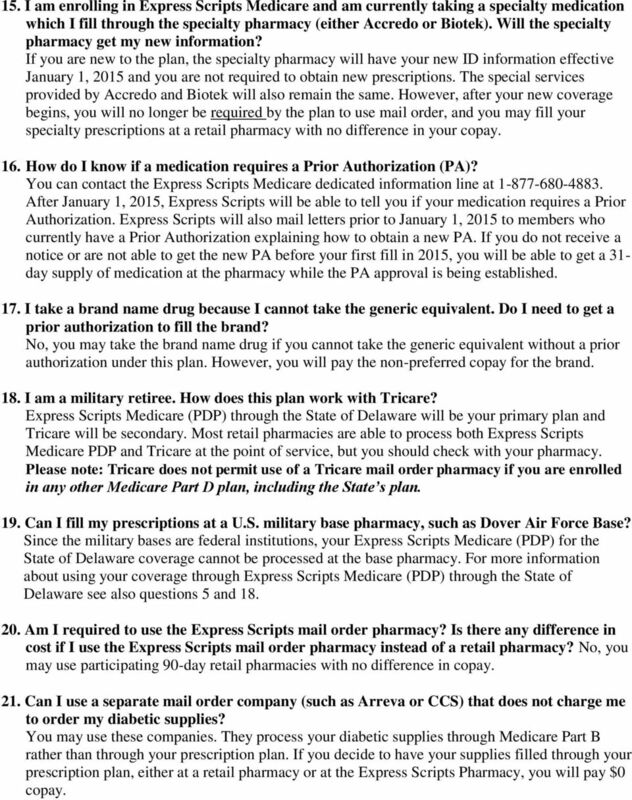 Express Scripts Medicare (PDP) through the State of Delaware will be your primary plan and Tricare will be secondary. Most retail pharmacies are able to process both Express Scripts Medicare PDP and Tricare at the point of service, but you should check with your pharmacy. Please note: Tricare does not permit use of a Tricare mail order pharmacy if you are enrolled in any other Medicare Part D plan, including the State s plan. 19. Can I fill my prescriptions at a U.S. military base pharmacy, such as Dover Air Force Base? Since the military bases are federal institutions, your Express Scripts Medicare (PDP) for the State of Delaware coverage cannot be processed at the base pharmacy. 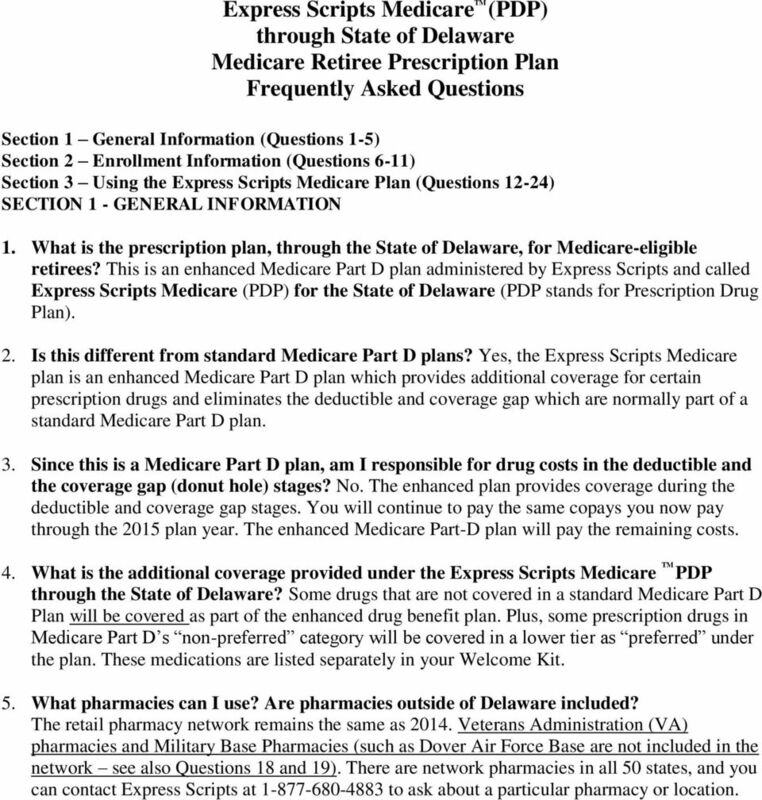 For more information about using your coverage through Express Scripts Medicare (PDP) through the State of Delaware see also questions 5 and Am I required to use the Express Scripts mail order pharmacy? Is there any difference in cost if I use the Express Scripts mail order pharmacy instead of a retail pharmacy? No, you may use participating 90-day retail pharmacies with no difference in copay. 21. Can I use a separate mail order company (such as Arreva or CCS) that does not charge me to order my diabetic supplies? You may use these companies. They process your diabetic supplies through Medicare Part B rather than through your prescription plan. If you decide to have your supplies filled through your prescription plan, either at a retail pharmacy or at the Express Scripts Pharmacy, you will pay $0 copay. 5 22. Can I use a manufacturer s discount card when I fill a brand medication? No. 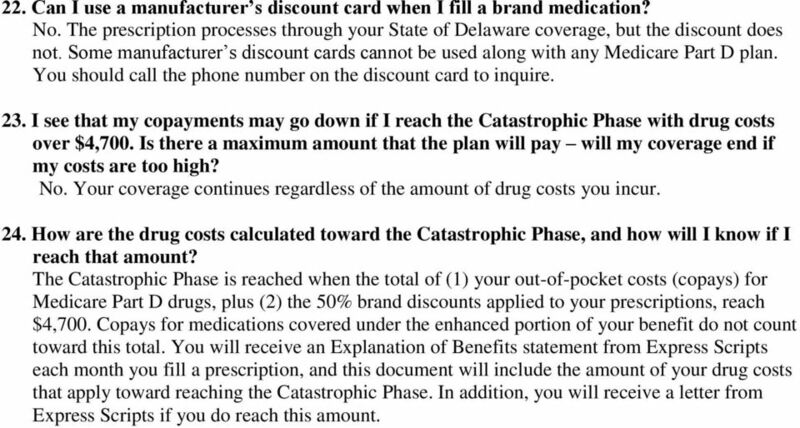 The prescription processes through your State of Delaware coverage, but the discount does not. Some manufacturer s discount cards cannot be used along with any Medicare Part D plan. You should call the phone number on the discount card to inquire. 23. I see that my copayments may go down if I reach the Catastrophic Phase with drug costs over $4,700. Is there a maximum amount that the plan will pay will my coverage end if my costs are too high? No. Your coverage continues regardless of the amount of drug costs you incur. 24. How are the drug costs calculated toward the Catastrophic Phase, and how will I know if I reach that amount? The Catastrophic Phase is reached when the total of (1) your out-of-pocket costs (copays) for Medicare Part D drugs, plus (2) the 50% brand discounts applied to your prescriptions, reach $4,700. Copays for medications covered under the enhanced portion of your benefit do not count toward this total. You will receive an Explanation of Benefits statement from Express Scripts each month you fill a prescription, and this document will include the amount of your drug costs that apply toward reaching the Catastrophic Phase. In addition, you will receive a letter from Express Scripts if you do reach this amount. Oklahoma Higher Education Employee Insurance Group Educational Meeting Welcome! SPECIAL EDITION for Individuals Not Yet Eligible for Medicare Your Retiree Health Care Travel Guide 2010 Enrollment for BorgWarner Pre-Medicare Health Care Coverage Welcome to 2010 Pre-Medicare enrollment!